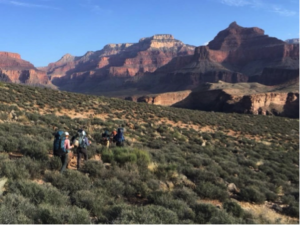 I recently had the opportunity to co-facilitate a leadership venture in Grand Canyon National Park with a group of leaders who were up for braving the wilderness with a rigorous 4-day hike in the Canyon. My role was to help the participants prepare, process and gain perspective about themselves and their experience before, during and after the journey. This expedition was challenging on multiple levels, and required all of us to dig deep physically, mentally, emotionally and spiritually. 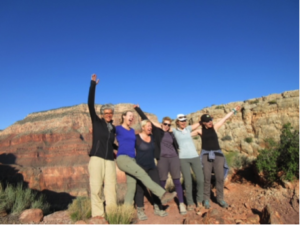 The trip involved hiking 8 – 12 miles per day over rugged terrain while carrying a 35-40 lb. backpack, camping in a tent overnight, descending into the canyon in 80+ degree temperatures, hiking tricky trails and conditions including battling 40 mph winds while navigating the steep edges of a cliff, and ascending up and out of the canyon over a mile in vertical elevation in one day…still with that backpack on. I describe the last day as climbing up what seems like an endless staircase for about 4-6 hours with a heavy load on your back after waking up at 3:30 am to pack up camp and hit the trails by 5:00 am. Can you imagine it? Each of us in our own way faced a unique test of strength and resilience that surfaced during the 4 day venture. Whether it was dealing with physical ailments from severe blisters, to aches and pains from the weight of the pack, to lack of sleep from the wind howling so hard it kept you up all night, to the endurance required to do a level 4 (out of 5) hike, day after day. Some of us also struggled with mental or emotional challenges such as being comfortable with the silence and without our precious devices or connection to the busyness of the world today and our friends and loved ones. For others’ it was keeping focused and calm during daunting moments–for example which is better, being blown off the edge of the cliff or falling into the side of a cactus? (The correct answer is cactus)–to having to stay centered and grounded when the personalities of the group under intense conditions tested your patience; to not getting squeamish when having to flick off several large worms and caterpillars that dropped on your tent and explains the splat noises you heard all night long…to having to let go of what you thought you could accomplish physically, and perhaps had done so in the past, but now had to face the reality that things may be changing and you might not be able to do what you’ve done before. It’s a lot to work through on multiple levels while also focusing on the task at hand–getting to the next destination safely and all together. Seeing people show up and step up for themselves and others was beautiful to watch and also quite humbling. What I learned most from this trip is this: we, a group of 8 random individuals, were thrown together accidentally but on purpose, and were all so different yet had so much in common. We influenced and touched each other in small ways and big ways. We may have judged each other, under (or over) estimated one’s own strength or endurance, or felt frustrated and even envious at times of one another. But in the canyon, we saw each other’s humanness—the pain, the struggles, the triumphs and loss; the desire to be loved and accepted, and how the realities and hardships of life impacted us all and shaped who we are today. It was an amazing gift and experience to witness the coming together, pulling apart and unfolding of each person individually and collectively and to see insights and wounds appear and dissolve. 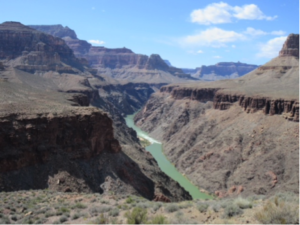 It truly was an accelerated form of growth and development – accomplished with nature and the grandeur of the canyon as a backdrop and a wise and patient teacher. Because we were focused on a specific goal, without distractions and the ability to take in the silence, be mindful, and focus our attention on what we needed most, it was ideal conditions for this type of transformation to occur. What I witnessed and learned as a facilitator and participant on this trip was incredibly inspirational and taught me a lot about leadership, resilience, strength, commitment, teamwork and the human spirit. It made me realize that real change and growth happens when we push ourselves out of our comfort zone to achieve a challenging goal that may seem impossible, but with a vision, support, a plan, and the desire to keep moving and put one foot in front of the other, is not only doable, it’s transformative and life changing. It is the experiences on a leadership venture like this that truly cause us to reach new heights, both literally and figuratively. In fact, after reflecting on this journey, I’m ready to go on another one, this time to hike the Andes in Patagonia. Will you join me?